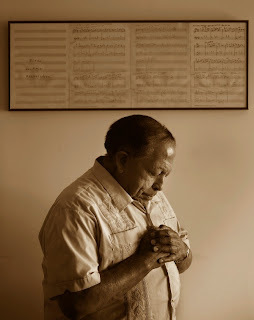 Home \ Blog \ Cachao – we thank you sir. “Cachao is our musical father. He is revered by all who have come in contact with him and his music,” Andy Garcia said in a statement Saturday. “Maestro . . . you have been my teacher, and you took me in like a son. So I will continue to rejoice with your music and carry our traditions wherever I go, in your honor”, said Garcia. That photo is from photographer Carl Philippe Juste, and the quote is from the LA times obituary on the great Israel ‘Cachao’ Lopez, who died Sunday night at Coral Gables Hospital in Fl. He was 89. Here is the obituary from the NY Times, by Jon Pareles, entitled Mambo’s Inventor Dies at 89. Below is the King of Mambo in a brief interview from Distrikt Magazine posted on youtube. I had the pleasure of meeting you a few times sir. It was a privilege.